Header driver Colin Cahill taking off the Jones’s crop in November 2015. 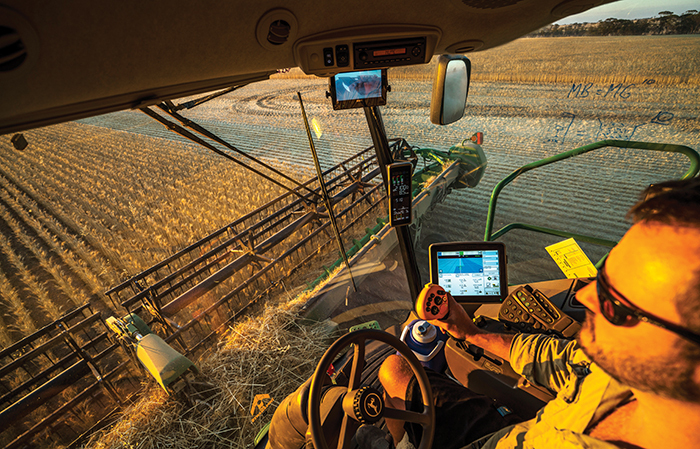 Brad Jones hopes that one day his farm will be a familiar sight to consumers who, as virtual visitors via tablets or smart TVs in their kitchens, will come to regard cooking a dish such as noodles as a natural extension of his work as the grower of the wheat they were made from. It is a vision that Brad is well on the way to achieving, having already hosted a visit by representatives of a large Chinese food company that is exploring the feasibility of siting a processing facility near his farm at Tammin, in WA’s central wheatbelt. Wheat coming in from the header to the on-farm storage. For Brad the time has arrived for growers to become more proactive in getting closer to consumers – mirroring the global trend of consumers looking to learn more about the origins of their food. “Technology allows us to do this virtually – showing the quality assurance and traceability that our methods of production provide,” he says. In November a delegation from the Hainan Yangpu Haifa Flour Co Ltd, which supplies much of southern China, visited Brad’s farm to discuss siting a processing plant in the district to close the gap between production and their supply chain. Brad says the Chinese company’s main hesitation stems from the higher cost in Australia of components such as labour and electricity. “These are some of the factors the company still has to work through, but it is a clear sign that our traditional supply structure is evolving into a more integrated system,” he says. Brad believes the traditional hub-and-spoke supply-chain model represented by a port and numerous up-country storages needs to evolve to accommodate more ‘just-in-time’ supply, similar to what he has seen in North America. 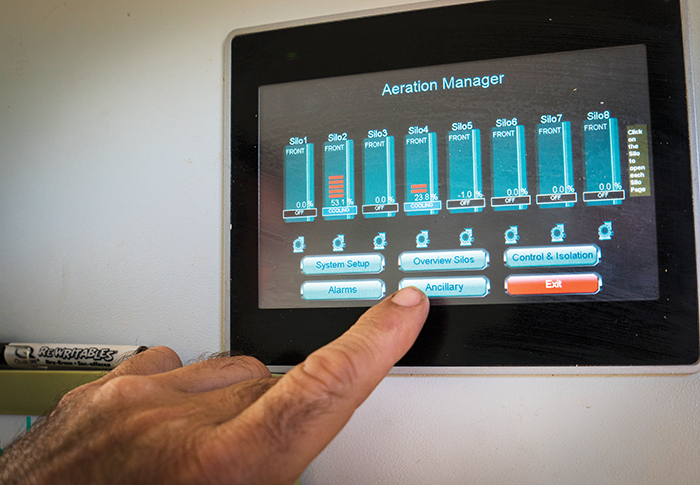 Silo aeration is fully automated on the Jones’s property. 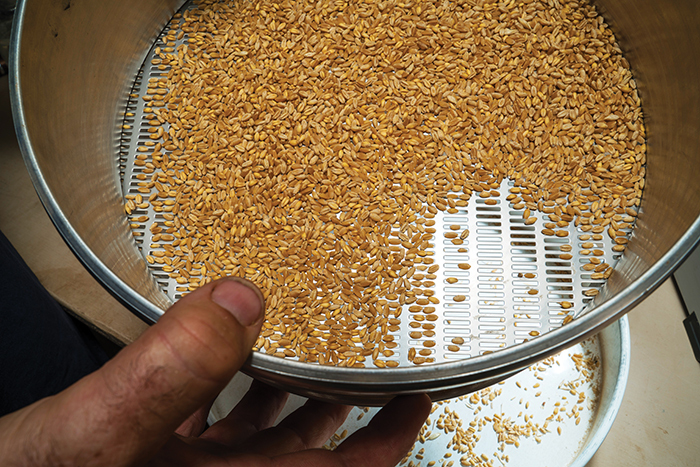 This means a change from growers just feeding a supply chain to being inside the supply chain through their own on-farm storage – a change already gathering momentum in many grain-growing districts. “I think we are going to see a supply chain in which the traditional bulk handlers will be able to accept just-in-time receivals from growers as well as from their own up-country storage,” he says. 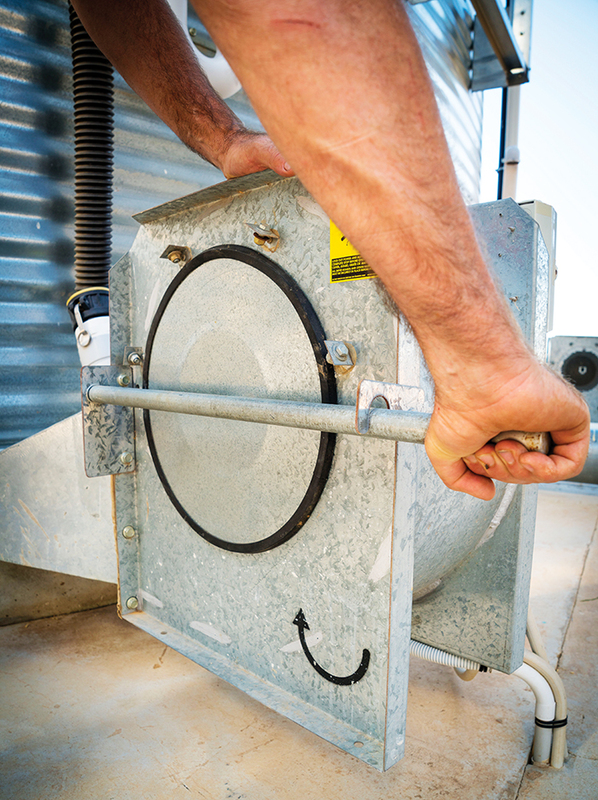 Sealing a silo for fumigation. For Brad it becomes what he calls a ‘value-share model’ between the acquirer, be it an established bulk handler or an end user, and the grower: “The acquirer can reduce or remove the cost of up-country storage and storage maintenance and that saving is shared with the grower. 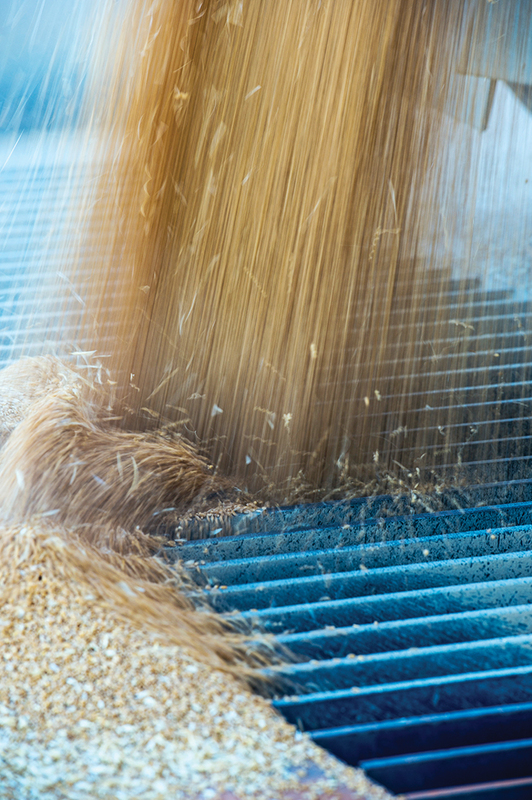 His argument is that instead of the industry sinking capital into maintaining old infrastructure to not only protect but elevate grain quality, the supply chain as a whole would benefit from growers shouldering this investment and being paid a premium for delivering high-quality grain to the most efficient dispatch point. While Brad has invested in his own storage facility – a sophisticated, fully automated complex able to blend or aggregate grain for buyers as it is trucked in from the header – he feels the most economic grower storage would probably involve several growers, perhaps on a district basis, due to the economies of scale. His storage facility can hold up to 40 per cent of the harvest from the 9000 hectares that is cropped and his objective is to reach 70 per cent capacity “depending on the opportunity cost of capital”. Operating in a dryland cropping area, Brad acknowledges the risk posed by climate, but feels the notion of risk has been skewed: “We are conditioned to see risk as a negative, but I see risk as an opportunity to do well. 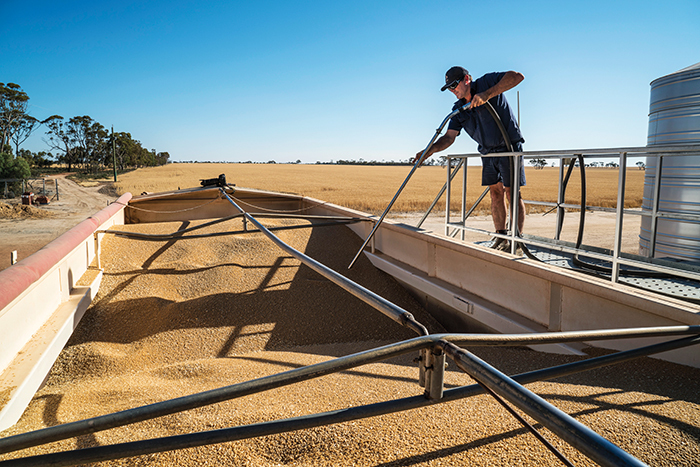 “For me, the risk of setting up a long-term relationship with a processor who buys 50 per cent of my grain while it is still in the silo and who has the last right of refusal over our other 50 per cent, and who is close to the consumer, is a wonderful thing. ”That said, Brad runs a tight program that is very much about risk management; so much so that every second season he takes the ‘risk pressure’ off by switching his crop targets from human food markets to the intensive livestock feed market. The rationale is about taking pressure off the system and the people by not ceaselessly pushing for the maximum. “We run a tight rotation – wheat, canola, field peas or a chemical fallow – and the first year of the rotation is grain for human consumption. In the second year I move towards the livestock markets: high quality feed with good metabolising numbers and digestible energy numbers. “When you overlay scale increase, which is what we have been doing, with climate variability you have a lot of skin in the game. One small misfire can hurt badly, so we use this rotation as a way to not be hostage to just one overarching market. Brad Jones spearing wheat to sample during the previous harvest. A lot of that pressure comes from a relentless drive to keep increasing efficiencies: “Efficiency is the key to profitability and risk management. “We pursue an achievable production goal, given a season’s outlook, so that a better-than-expected finish is not the deciding factor but a bonus. And within that we are working to achieve the required return on capital. Read this article in GC West issue 122 - Subscribe and recieve the hard copy of GroundCover in your mailbox for free, remember to select 'Post' as your subscription method.